Though K-State baseball (13-17, 3-7) was able to get the winning run to the plate in the ninth inning Tuesday, they were unable to capitalize as they fell to No. 23 Nebraska 5-4 in 10 innings at Tointon Family Stadium. Nebraska was able to strike first, scoring three runs against K-State starter junior Kyle Halbohn in the second inning to take an early 3-0 lead. The Wildcats answered in the bottom of the second inning, as junior catcher Tyler Moore was able to single to center and drive home sophomore infielder Steve Serratore to cut into the deficit. After a Cornhusker home run extended their lead, K-State went to the bullpen and found success with three underclassmen who helped put up six innings of scoreless baseball to give the Wildcats an opportunity to come back. In the sixth inning, Serratore grounded out to score junior infielder Tyler Wolfe. Moore then earned his second RBI of the night with a double that stretched into a triple thanks to an error. Junior outfielder Taylor Anderson capped off the rally with a single to center to bring Moore home and even the score at four. 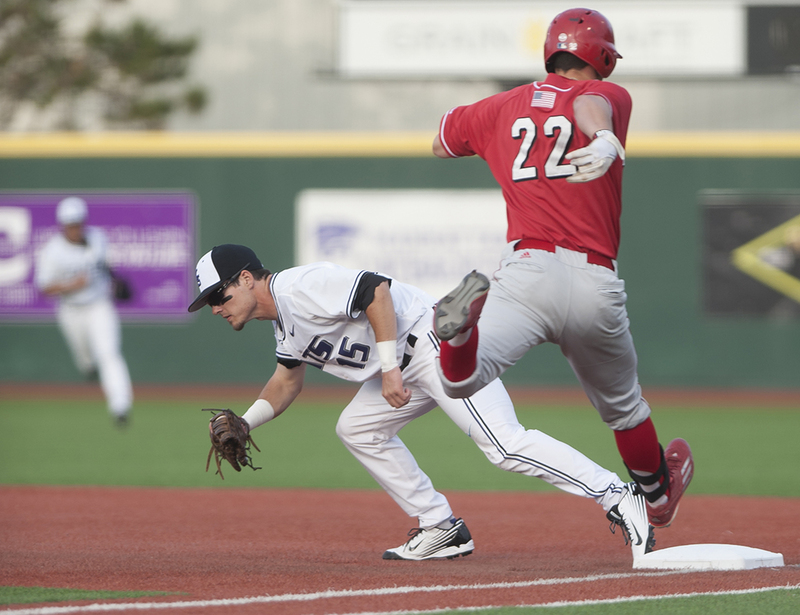 K-State and Nebraska traded one-two-three innings up until the 10th inning when a Cornhusker single scored the go-ahead run that eventually turned into the game-winning run after the Wildcats were unable to score in the bottom of the frame. Before jumping back into Big 12 play, K-State will head north tonight to take on Nebraska-Omaha in a second midweek game at the home of the Kansas City Royals Triple-A affiliate, the Omaha Storm Chasers. The Wildcats and Mavericks were slated to play a game in Manhattan on March 25 before it was rained out. Nebraska-Omaha comes into tonight’s game losers of five of their last seven, but they are fresh off a series win against Western Illinois. K-State is 7-1 when playing Nebraska-Omaha and most recently fell in a 6-5 extra inning game in 2014. K-State senior Mark Biesma (0-1, ERA 8.31) will take the mound against Shane Meltz (2-2, 3.57). First pitch is scheduled for tonight at 6:35 in Papillion, Nebraska at Werner Park.